Pastels and I do not mix. I really wish we did but we just don't. It's mainly the pastel cremes that disagree with my skin tone. I can sometimes pull off ones with a different finish, but that to isn't common. It's ok, though you can't win them all. 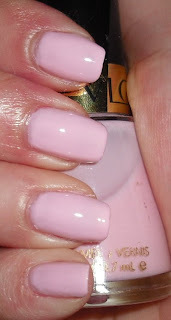 I didn't really win it with this color Revlon Pink Chiffon. I really loves this color, but it doesn't love me. Pink Chiffon is a pastel baby pink jelly. Yes, jelly. That is why I love this color. I find jellies a rarity by themselves, but I find pastel jellies even more rare. I love the squishy look to this. Sadly, this looks absolutely dreadful against against my skin tone. It gives me "lobster hands" that look very red and sickly. Oh well, you can't win them all? Speaking of sickly, I got my flu shot yesterday. My mom when I was little used to make me get one every year and every year I never I got the flu. Last year, I decided not to get either the seasonal flu shot or the H1N1 swine flu shot and I ended up with swine flu. It was around October when it was going around here. I didn't get a terrible case of it, and it didn't last too long, but long enough. It was about 3-4 straight days of chills,fever,muscle aches, coughing, and nausea. No thank you. Not again. This year they've combined the strains of seasonal flu with the H1N1 into one shot, so hopefully I'll be flu free! Plus, I got my shot at Walgreens which gave me $3 off coupon for any purchase I made that day. Flu free and $3 off nail polish goodies, I have no complaints! Are there any types of colors that don't work for you? I second the non pastel look on me. sorry about the swine flu- a kid died here (school) from it last year, and being that we have nearly 20k students, several thousand got sick here... it was an epidemic. good luck for this year! it makes my hand looks really dark and i hated it..
$3 off on nail polish is a great incentive to get the shot...well, that and NOT getting sick. LOL I know what you mean about loving a color and it not loving you back. I keep them anyways and wear them when I feel like it cuz I still luvs them. Score on the nail polish goodies :). I really like that pastel creme, which is funny because I really don't like creme polishes a lot and I have very few of them. What doesn't work for me? Mint green. ALL of them. Just holding the bottle up next to my hands makes my skin look red, even the very blue ones. I've found only one light green that looks good, and it's very gray and shimmery. I never got the flu shot until I met my hubs. He had a real bad bout with the flu, before we met, and it almost killed him! Since he has always had heart issues, this was part of it. So, I get the flu shot so I don't end up giving the flu to him. Oh my!! You had swine flu!!! Terribly scary!!! 1xellus1-Bleh swine flu was no fun! yokemun-It is a pretty pink! I do better with darker colors too. Lacquer-Yeah, I'm going to keep this one too. I'll probably wear again I like it that much. TropicalChrome- Mint greens are a nightmare for me too. The only one that works is Sinful Colors Mint Apple for me. Justine-I usually can't tell until after I put the polish on. If I like the color enough I'll keep wearing it. Ice Queen-I haven't tried cafe au lait shades. I have feeling they wouldn't suit me well either. Kimberly-Yeah sadly it didn't. Swine flu wasn't that scary. I got it when it was going around heavily in fall. At that point they were telling you not to even go to the doctor unless you had severe symptoms. It was just stinky and didn't feel good. Hmm, I think yellow is not working for me or I haven't found the right shade for my skin tone? this is a very fab pink. love it!